Between 2005 and 2015, almost half of all impact capital disbursed in East Africa had found its way into the Kenyan market, representing more than US$650 million of private impact investment capital and more than US$3.6 billion of DFI capital. When Shannon May choose to visit Kenya on her honeymoon, there was little indication that she was going to stay longer. However, on landing to Nairobi, she saw so many opportunities that have kept her in the country for almost ten years. than 100,000 pupils every day at one of 350 pre-school and primary schools across Kenya. “What my partner and I saw in Kenya was an opportunity to bridge a gap that existed between users of education which are the children and the government education system,” she notes adding that in the years the academies have been in existence, it has reached the most needy of children in different parts of the country. For example, thousands of Bridge pupils who sat the Kenya Certificate of Primary Education (KCPE) excelled, despite family incomes of about $1.60 per person per day and hailing from communities trapped in the poverty cycle and often plagued by unrest. They have often hit turbulence with government officials but they are still growing strong. “Education should be in your portfolio if it isn’t yet – there are 300 million children in school not reading. We need something to change, expand your portfolio, invest in education and join the GSG to see impact investment expand across the African continent,” she added. Bridge International Academies is one among many mostly foreign investors who are finding investment opportunities in Kenya offering services that otherwise are offered by governments. These investors who mainly invest among the poorest in the society commonly referred to as social entrepreneurs have now acquired a new title; Impact investors. More than half of the deals made by private impact investors were less than US$ 1 million whereas majority of deals by DFIs were between US$ 5 million to US$ 50 million according to Global Impact Investment Network. The allure of an expanding economy in Kenya as well as availability of pockets of poverty among the citizens opens up space for Impact Investors into Kenya. Economically, Kenya has seen GDP growth has averaged between four and six per cent annually since 2011 and there is little indication of decline: the World Bank estimates that the annual growth in 2019 will be 6.1 per cent. Foreign direct investment (FDI) in Kenya increased to USD 672 million in 2017 , representing a 71 per cent increase from 2016. This is particularly striking considering the 22 per cent drop in FDI in Africa as a whole and a 23 per cent fall-off globally. Kenya’s large population of under 35 years old people are shifting their mindset from ‘job seeking’ to ‘job creating More than 70 percent of the population in Kenya is under the 35 years of age. In the absence of adequate avenues for formal employment, Kenya’s youth is exploring entrepreneurship as a means of livelihood. As per the latest estimate by the British Council, there are over 44,000 social enterprises in Kenya, 60% of which have been created between 2013 to 2016. Kenya is attracting dialogues on how to expand the avenues for social investors. 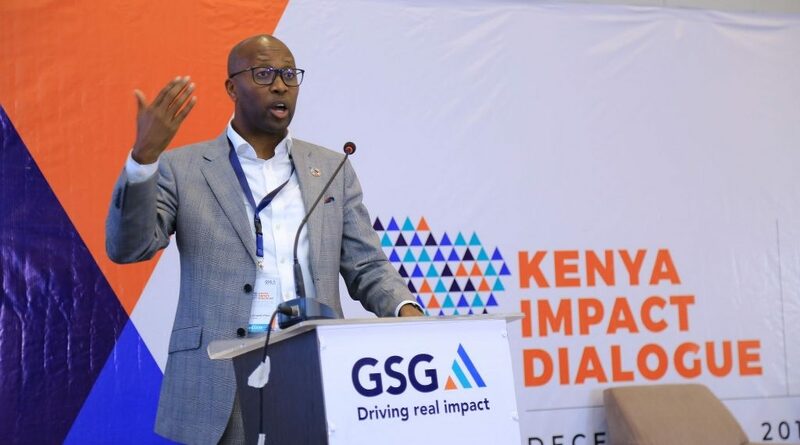 The Kenya Impact Dialogue was such an event organized by the Global Steering Group for Impact Investment (GSG), a global steering group of impact investors. The GSG was established in August 2015 as the successor to, and incorporating the work of, the Social Impact Investment Taskforce under the UK presidency of the G8. The GSG currently represents National Advisory Boards in 21 countries plus the EU as members. The team is in the process of establishing National Advisory Board in Kenya, a step that has received backing from major private entities including Kenya Private Sector Alliance (KEPSA) and the East Africa Private Equity & Venture Capital Association (EAVCA). In her keynote address, Ms. Betty Maina, Principal, Secretary to the State Department for Industrialization, Republic of Kenya, said the formation of National Advisory Boards (NABs), presents an opportunity to identify opportunities and resolve challenges faced by impact investors and entrepreneurs by engaging policymakers and informing the development of national impact investment strategies. “We appreciate the platform provided by GSG for countries engagement to co-create policy interventions for inclusive and sustainable development through impact investment,” she added. Ms. Betty Maina said: “We as governments ponder on the best way to address the ever demanding economic, social and environmental challenges. “With the ever-diminishing fiscal space, it is evidently clear to many governments around the world that we can no longer rely on the public sector resources. Private equity and venture capital, beside philanthropy, is increasingly becoming an important complement to scale up impact investments through collaborative action by making the needed policy changes,” she said. Maryanne Ochola, East Africa Regional Chapter Manager at Aspen Network of Development Entrepreneurs (ANDE), kicked off proceedings with a wake-up call, saying time was running out in the fight to eradicate poverty. “We have a financing gap of $2.5 trillion towards the development of the UN Sustainable Development Goals (SDGs). We need to acknowledge that governments can’t do this alone and we need private capital to meet societal needs. Impact Investment affords us the opportunity to unlock financial and social good,” she said. Ochola explained that globally, impact investment has grown by 41% in terms of compound annual growth rate (CAGR) to reach over $250 billion in assets under management (AUM). Kenya has also seen a rise in venture capital and other investment funds that have helped raise the level of innovative ideas in the market. Some of the major social entreprises are in the area of water and sanitation, energy, agriculture and education. In the Theme Address, GSG CEO Amit Bhatia stressed that the impact movement has the same core characteristics as other successful movements have, with the simple premise that it can be understood by all. “All movements are replicable and decentralized, all successful movements are inclusive and abiding – they engage all citizens, all actors, irrespective of caste, religion, nationality etc., the impact movement is inclusive, the left, the right, big businesses, small businesses. We need to bid goodbye to aid and donors – we need to fix capitalism first,” Mr. Bhatia added. 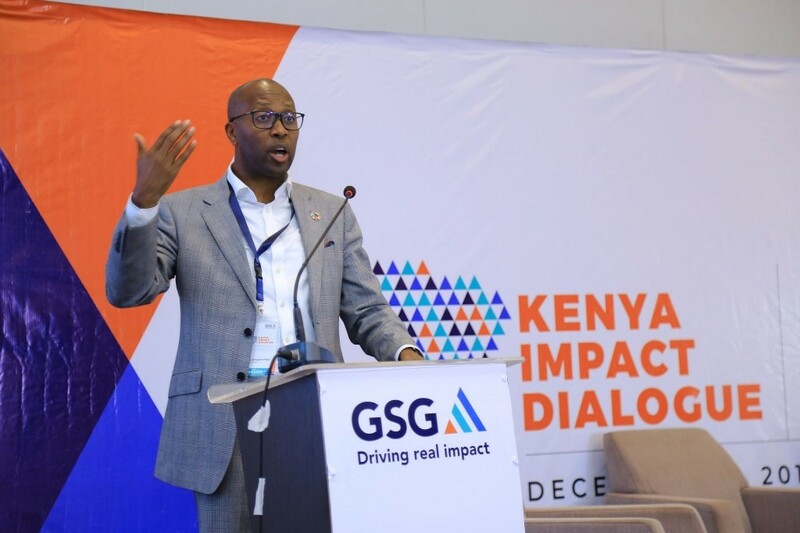 Dr. Githinji Gitahi, Global CEO of Amref Health Africa Group and the focal point man on the Universal Health Care in Kenya observed that Kenya is ripe to take advantage of Impact investments to bridge the gap on what the government is struggling to do. “When we have profits, we need to be shy and hide it. We might otherwise be labelled as profiteers,” he said. Robert Karanja, Lead, The B-Team Africa, said “Governments provide an enabling environment, but we’ve seen corporates encourage young people to be their (own) bosses. Siddharth Chatterjee, UN Resident Coordinator said impact investment is where the private sector can make huge profits. Challenging impact investors to think big, Chatterjee added that there was room for profitable investments through economies of scale. “Kenya needs to make itself creditworthy and investor-friendly. The NAB is great because it’s coming from a country that also helped to create the SDGs,” he said. The number of investment funds are increasing, however the fundingis going to a small number of enterprises. More investment funds are enteringthe region; however they are investing in same enterprises, with the majorityof funding being allocated to the larger expat founded social enterprises. Forinstance, just five enterprises – M-Kopa, (off-grid electricity, PAYG company),Angaza, (sales and payment management provider) Tala (a consumer lending app),Off Grid Electric (clean energy provider) and Branch (a lending app) – receivedover 70% of disclosed investments in the region between the period of 2015 and2017.